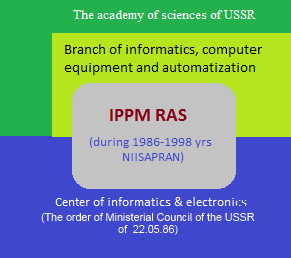 Institute for Design Problems in Microelectronics of Russian Academy of Sciences (Research institute for VLSI CAD Systems by April 1998) was created by decision of RAS Presidium dated October 01, 1986 based on Central Committee of the CPSU Decree dated October 01, 1986. This Decree was devoted to creation of large interdepartmental Center for Informatics and Electronics (CEI). CEI had to include twelve research institutes and factories from five Ministries and Departments including IPPM RAS as the institute of academy of sciences. The initiative to include RAS institutes into CEI structure to provide tight interaction and interference belonged to Vice-President of the academy of science, academician Mr. E. Velikhov and academicians Mr. Valiev and Mr. Naumov. The main CEI objective was ensuring of USSR superiority in the field of computer sciences by development of design and production of perspective computer techniques based on newest microelectronic technologies. IPPM had to develop perspective VLSI CAD systems to achieve this objective. To bring this idea into life, the Decree stipulated that IPPM would have own building with square more than 5000 sq.m with own laboratory and computer center. It was planed that institute staff had to be up to 300 persons.